Compatibility - Only supports IOS 8.0 / Android 4.3 or higher version. Auto recognition of up to 10 users' profiles. Why do you need a Body fat Scale? Health does not just depend on your weight. Whether you want to lose weight or keep Shape and Fitness, weight is not the only factor that needs concern. You should pay more attention to your body fat, water and muscle mass. But this information cannot be provided by a traditional weight scale. 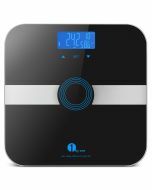 What can you get from 1byone body fat scale? Comprehensive Health Index: Body weight, Body fat, Body water, Muscle mass, BMI(Body mass index) ,BMR(KCAL),Bone mass and Visceral fat. We do not recommend the groups below to use it: Individuals with medical implants, for example, people with a pacemaker, pregnant women. 1). First, ensure you have connected your mobile devices to the internet. 2). Searching "1byone Wellness 2.0" on APP store or Google Play or scanning the QR code in the manual to download the APP. 3). Then, ensure the Bluetooth function is enabled (no pairing required), just follow the manual to use the APP to control the scale. It can store up to 10 personal profiles in the APP. We recommend you to use it at the same time every day. Better in the morning after getting up or 2 hours later after meals. 1.A person's weight lightest at morning and heaviest at night. The difference between them is about 1 to 6 pounds. So we recommended to weigh at the same time period per day. 2. In Baby mode, you will weigh 2times and get baby’s weight, and ONLY weight available. If the above suggestions don't help, contact us and we can send you a replacement scale or assist with a refund. These three levels have been designed to best serve the various activity levels of our users. Ordinary: Do exercise equal to or less than 2 days per week. Amateur: Do professional training equal to or less than 5 days per week. Professional: Do professional training every day. IMPORTANT NOTICE: If you find the scale is inaccurate, place it on a flat surface, activate the scale, wait till the screen turns off, and then stand on the scale to do your weighting. Why can I not search for the scale in my Bluetooth setting? This device does not do Bluetooth pairing in the traditional manner. You need to download the app which then watches out for the Bluetooth signal (no pairing required). 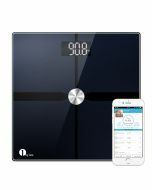 One advantage is that you can have multiple devices (you and your spouse for instance) all able to connect to the scale since it's not paired to one device.